The future of our planet and the fate of humanity is under threat from a world ravaged by climate change and ecological degradation. It is ironic that Just as the world began to collectively assume responsibility, Americans elected Donald J. Trump to assume the helm of the most powerful and influential nation in the world. This was a tragic end to a fateful year. There were a host of problems at the Rio Summer Games this included scandals, deforestation, water pollution, an economic crisis, political instability, sexism, child prostitution, poverty, and inequality. The lies and corruption at the Brazilian games eclipsed other recent major sporting events. Fossil fuel subsidies are antithetical to climate action. At a time when we need to make pollution more expensive we are instead providing incentives for a wealthy industry to pollute. This makes no sense in the US, Canada and many wealthy countries around the world. Most economists who understand climate change agree it is time to remove subsidies for the fossil fuel industry. The G20 agreed to do so but in 2016 nothing was done. Corruption has been identified as a major drain on the resources of our world. This point was made convincingly by the release of the Panama Papers which showed a large number of politicians and others are engaged in an effort to shelter their wealth from taxation. We know that sustainability combats the culture of corruption and in 2016 we have some new tools including GRI's new sustainability reporting standards. We have seen corruption overwhelm Brazil and the Rio Olympic Games. The floodgates of corruption are about to open in the US with the election of Republican majorities and Donald Trump's kakistocracy. Republican lawmakers have already tried to remove ethical oversight of their activities and Trump has promised to eliminate regulations designed to tamp down corruption. The anti-intellectual sub-current has intensified of late. Many now believe that their ignorance is equal to our science. At a time when reason is so important to making informed decisions, conservatives are trying to eradicate climate science education in schools. The election of Trump is a serious blow to efforts to restore science to its rightful place. The implications of the President-Elect's disdain for science are serious. Among other things he has promised to gut NASA's climate research. Such opposition to science invites a climate catastrophe. Fish swim, birds fly and oil spills. As revealed by this partial summary of oil spills in 2016 last year saw a number of spills as did the year before. In an ironic twist of fate new pipeline safety rules were followed by another oil spill. Shell alone was responsible for two spills in two weeks and another in the Gulf of Mexico. Repeated spills in Peru threatened the very survival of indigenous people. There were also a number of oil train derailments including one in Oregon adjacent to the Columbia River. The frequency of these spills is in part a function of oil companies allocating far more resources to seeking out new oil reserves than they do to ensure pipeline safety. The soulless self-interest of fossil fuel companies is unconscionable. One of the tragic realities that became painfully evident in 2016 was the fact that sophisticated campaigns of deception are being employed by industry to advance their agenda and undermine science. The best known is Exxon's subterfuge which amounts to crimes against humanity. However, shortly after the news of Exxon broke we soon realized that Exxon is not the only bad apple and the who fossil fuel industry is rotten to the core. Big oil has systematically engaged in sophisticated campaigns of lies and misinformation. Led by Volkswagen the auto industry has been shown to have misled people and governments by cheating on emissions tests. This has cost Volkswagen dearly, however, the German automaker is hardly the only car company committing fraud. Most recently Fiat Chrysler were implicating in an emissions cheating scandal. Other industries that have engaged in subterfuge include big sugar. There are also groups funded by industry (commonly fossil fuels) that work to promote an anti-science, anti-climate agenda. The Heartland Institute is one example. They and others are at work in California and elsewhere to undermine the state's stellar green efforts. Climate change is the biggest threat we face it is also the most expensive. We have known for quite some time that climate change comes with a massive price tag. The economics of climate change are clear, we must act and we must act now. We know that a cost benefit analysis reveals that it is far cheaper to act on climate change than it is to defer action. The longer we wait the more it will cost. The most up to date research reveals that we simply cannot afford to deny the cost of climate change. The cost of rising seas alone is staggering. At the start of last year it became apparent that 2015 was the hottest year on record and 2016 was predicted to be even hotter. As scientists suggested at the start of last year, 2016 did turn out to be even hotter than 2015. We have amassed decades of hot data warning us of an impending climate catastrophe. Consistent ongoing heat is rewriting the record books. It was so hot last February that scientists declared a climate emergency. Last winter ended up being the warmest ever and we are seeing discernible changes to our seasons. Rising levels of CO2 are driving this warming trend particularly in the Arctic. We saw a spate of extreme weather in 2016 and advances in attribution science are making it easier to connect these events to climate change. One of the most disturbing occurrences in 2016 was the death of vast swaths of the Great Barrier Reef. Another devastating corollary of climate change is sea level rise. In addition to massive costs associated with flooding and adaptation, sea level rise will also drive an unprecedented mass migration of climate refugees. In 2016 we saw some massive floods including an historic flood in Louisiana. The primary cause of extreme weather associated with climate change is the fossil fuel industry, yet they have shown no interest in mitigation efforts. Mainstream media has failed to adequately communicate the dangers associated with climate change. They have ignored or distorted the facts about climate change and inadvertently helped to elect an irrational demagogue who eschews science. Fake news is serious and Donald Trump is the Godfather of fake news. Conservatives have been using fake news to control the narrative and the situation is destined to get worse. Russian dictator Vladimir Putin used his sophisticated spin machine to help elect Trump. Make no mistake about it, the election of Trump will increase the darkness of post-factual media. The sad truth is we now live in a world where facts no longer seem to matter. 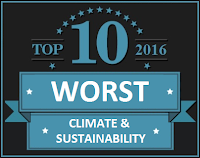 Lets be clear the election of Donald Trump is not only the worst climate and sustainability story of 2016 it may be the worst climate and sustainability story in human history. Even Republicans said that he was dangerously unqualified to be president. This tragic turn of events took place just as we were on the cusp of serious consorted global action. Trump cast a dark shadow over the proceedings at COP22. Now that this insane climate denying narcissist has been elected President there is virtually no hope that we will see climate progress in the US for at least four years. 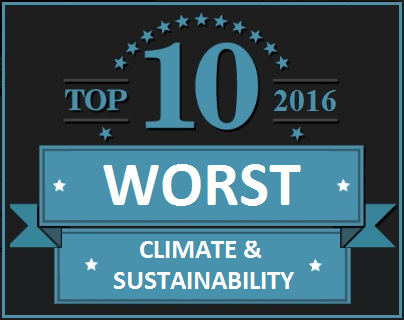 The reasons why the President-Elect is bad for the planet and its inhabitants are numerous. Like the river of lies that pour out of him every time he opens his mouth it is hard to keep up. It is not just the cavalcade of lies, nor the racist, bigoted and xenophobic nativism of this populist demagogue. Either because he does not understand or because he is trying to control the narrative Trump has repeatedly misrepresented the facts about energy. Trump's policy positions are a fantasy and his stance on climate, energy and the economy would be laughable if the implications of his ignorance were not so serious. Trump is Putin's puppet and he threatens to undo much of President Obama's climate action. To make matters worse Trump is surrounding himself with climate deniers (like his vice president Mike Pence and Scott Pruitt who was nominated to head the EPA). He has even nominated those who are most responsible for the emissions that cause climate change. Rex Tillerson, the former CEO of Exxon is Trump's pick to be Secretary of State). Tillerson and Trump have given indications that they intend to end sanctions against Russia (for the annexation of Crimea and interference in the rest of the Ukraine). Ending sanctions will result in expanded drilling in the Russian Arctic. It is true that businesses and investors will counter Trump's climate killing agenda. While many hope that market forces will keep moving climate action forward, the terrifying truth is that this will not be enough. Although Trump has vowed to kill climate action including the Paris Climate Agreement heads of state, climate scientists and business leaders have all warned Trump not to do so. We must keep fighting for the health of our planet, however, if the past is any indication of the present, we have no cause to believe that Trump will listen to reason. The combination of Republican control over the House and the Senate alongside the Trump administration does not bode well. In the face of record setting heat and rain in the US, the GOP doubled down on fossil fuels. Trump's pledge to increase extraction of fossil fuels may push us past tipping points from which we will not be able to recover. The Trump administration is an unprecedented departure from every US government that has gone before. It is not hyperbole to say that this administration will augur a dystopia that will have implications for generations to come. Hard as it may be we must face the terrifying truth about what the Trump kakistocracy means for our planet.